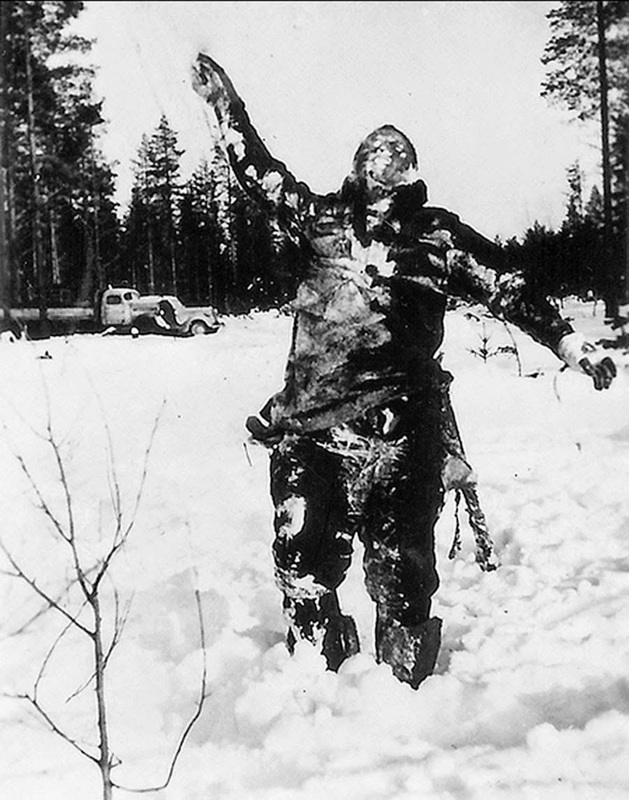 As Soviet troops invaded Finland in 1939, this frozen soldier’s body was propped up by the Finnish to try to intimidate the Russian troops. This was a bit of psychological warfare was used during one of the coldest winters ever registered in Finland, and apparently the soldiers took advantage of this to send a message. 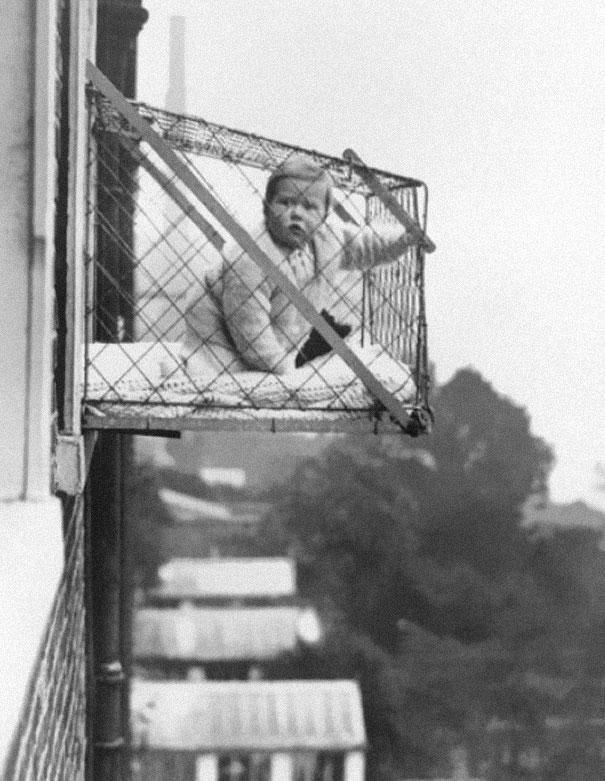 Although we would probably consider this to be child abuse, back in 1937 you may have used this trick to get some fresh air and sunshine for your kids. Seems a great place to grow a little garden, but for a child? 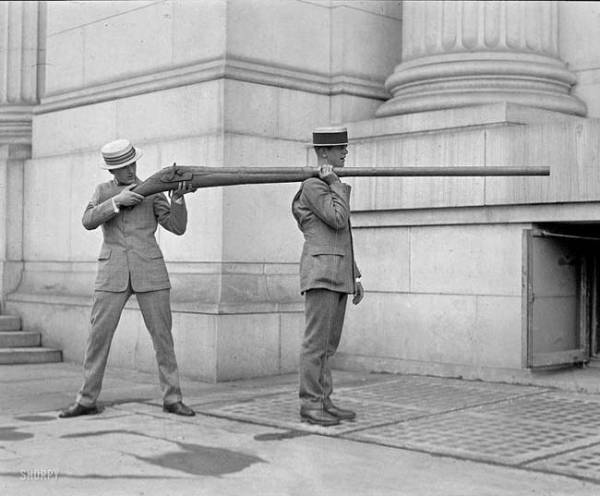 Known as the “Punt Gun”, this monstrosity was outlawed in the 1860’s because of how dangerous it was. It was believed to be able to kill up to 50 ducks in one shot. 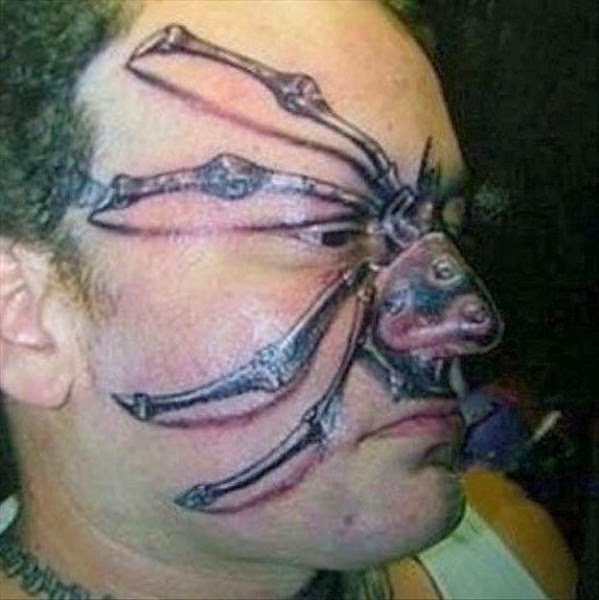 The question is, what kind of bullets does this thing take? They’re probably the size of cannonballs! 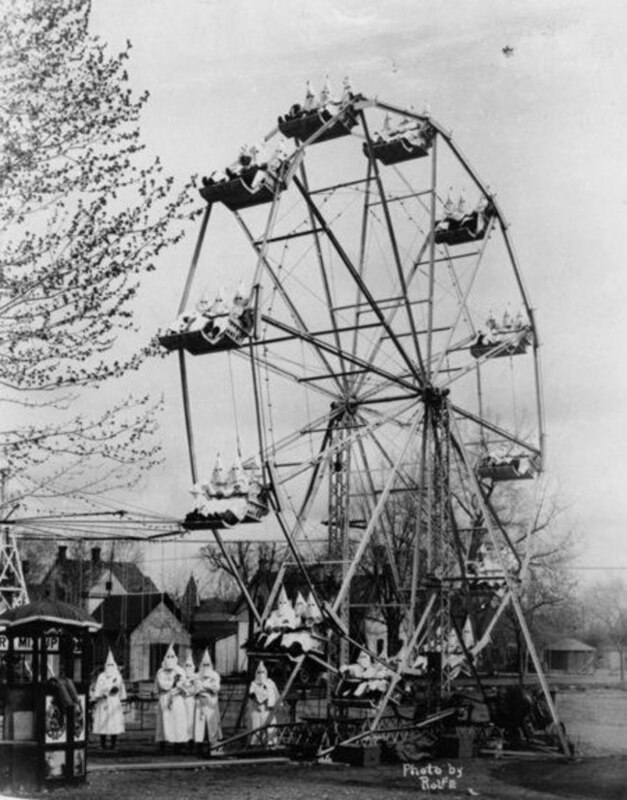 As demonstrated in this photo of white hooded people riding a ferris wheel, the KKK had a great deal of influence in Colorado in the 1920’s. In fact, the state’s governor at the time was a Klansman. Located in Canon City, Colorado, this extremely creepy fair was put on in what was considered the Klan “capital” in 1926. 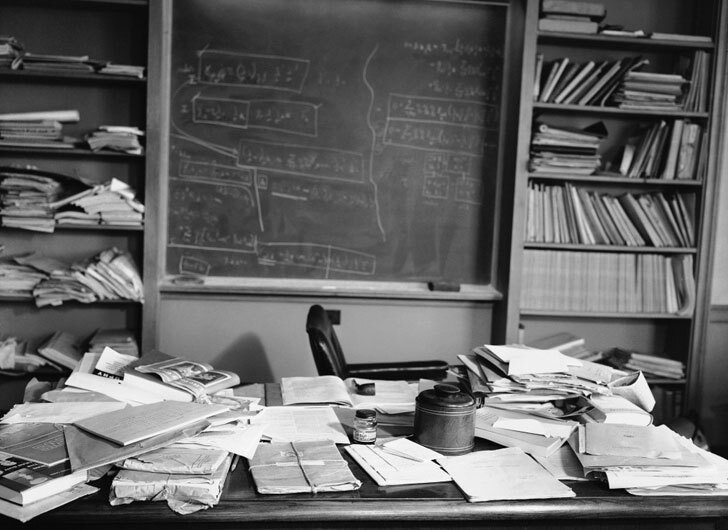 Left completely undisturbed after his death, this photo was taken of Albert Einstein’s desk in Princeton, New Jersey on the day that he died in 1955. Turns out, many geniuses are also very messy! Hollywood royalty meets real royalty in this rare photo. 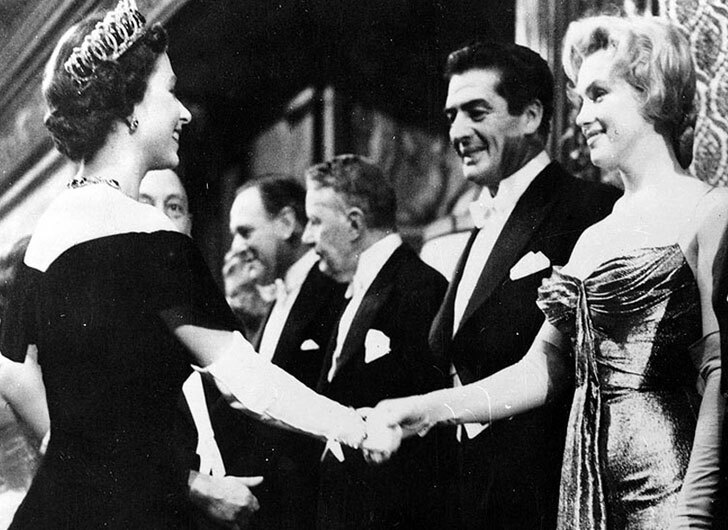 Taken in October of 1956, Marilyn Monroe had a film premier in London where she met Queen Elizabeth II in October of 1965. 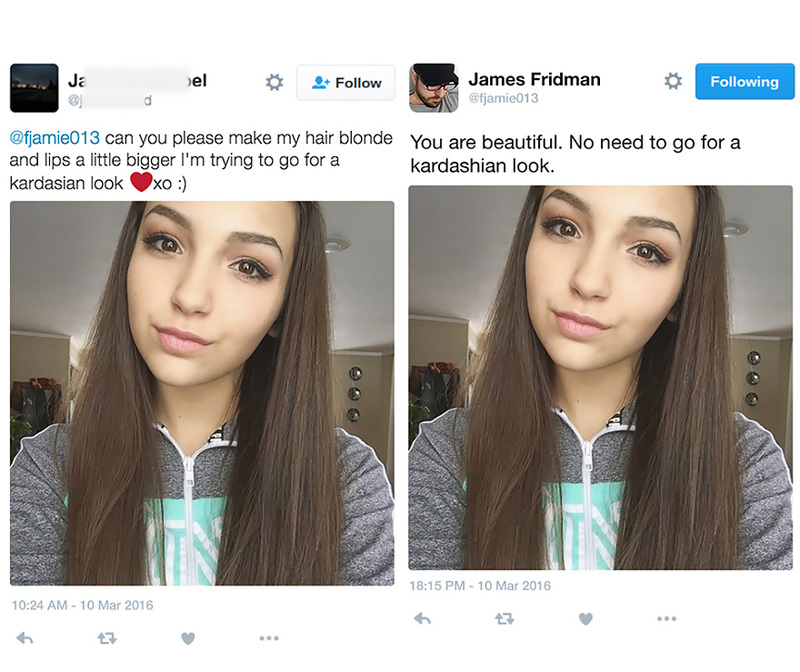 The women were actually the same age at the time, 30 years old. And since the queen is celebrating her 90th birthday, that means Marilyn would be 90 this year also. Sort of mind-blowing! Taken in San Francisco in 1972, just after a judge give a verdict of involuntary manslaughter to Dan White. 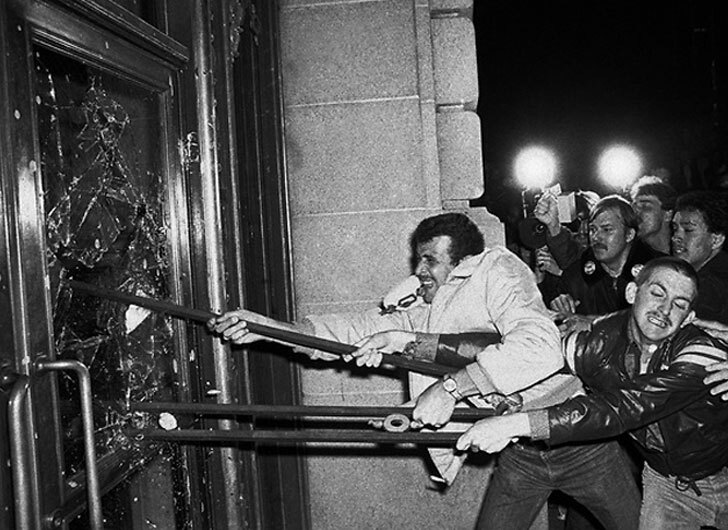 Dan White had killed Harvey Milk in a gay hate crime. This photo depicts the riot that followed this verdict as the crowd believed White should have been given a much harsher sentence. Back during the 1950’s and 1960’s in America, Martin Luther King, Jr. was a well-known activist for racial equality and the Civil Rights Movement. Those who were against equal treatment for all races would often burn crosses in the yards of black people and their sympathizers in order to scare them. 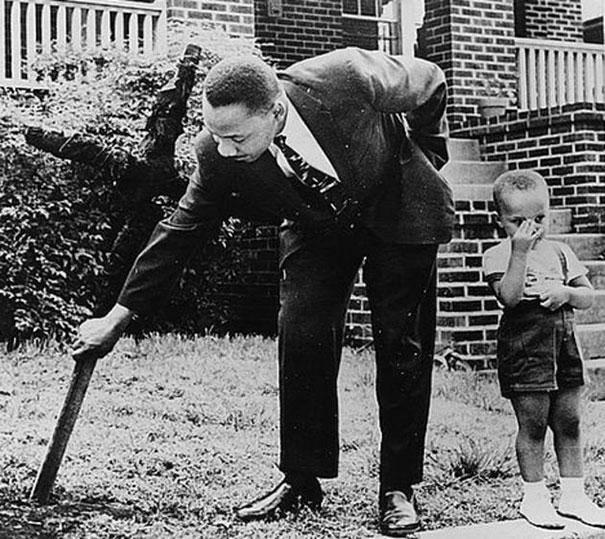 Here, King is depicted removing a burnt cross from one such situation. When bison were prolific in American, European settlers felt compelled to exterminate bison herds—believing that it might allow them to starve out Native Americans by taking away their food supply. 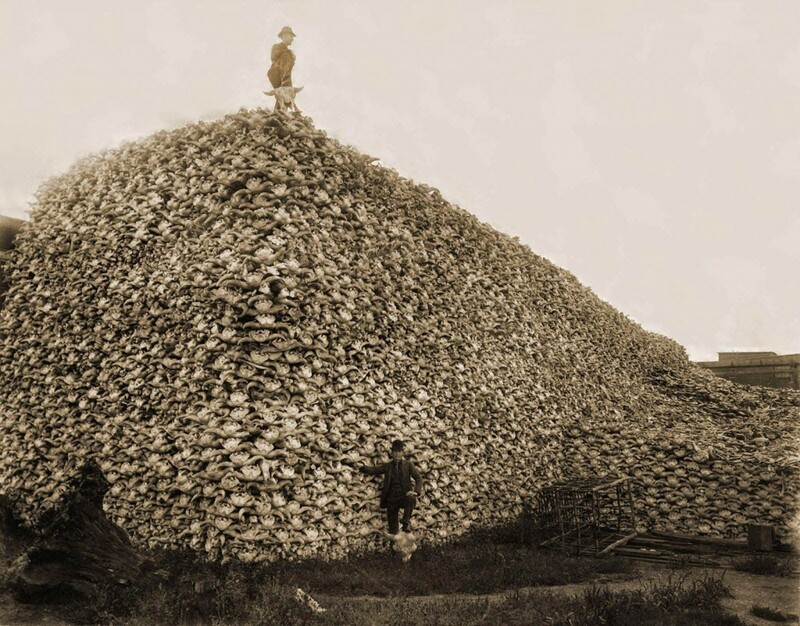 This photo from 1870 represents thousands of bison skulls which were collected during this time period. In July 1991, Mt. 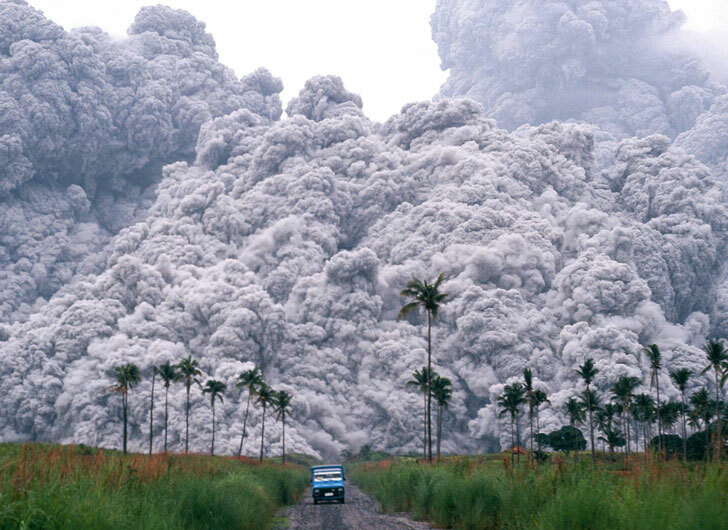 Pinatubo began erupting. Not volcanic ash, but Pyroclastic Flow, which is a mix of rock and hot gas that moves at speeds up to 450 miles per hour and can reach around 1000 degrees Celsius. This photo was taken as the small car was seen trying to drive away from the scene. This may have been thought to be a funny joke but, sadly, it wasn’t. Back in the 1940s when people with large families had a hard time feeding all of the mouths, so this woman and her husband decided to do something about it! The children were given new families, some had terrible livers where they were abused. 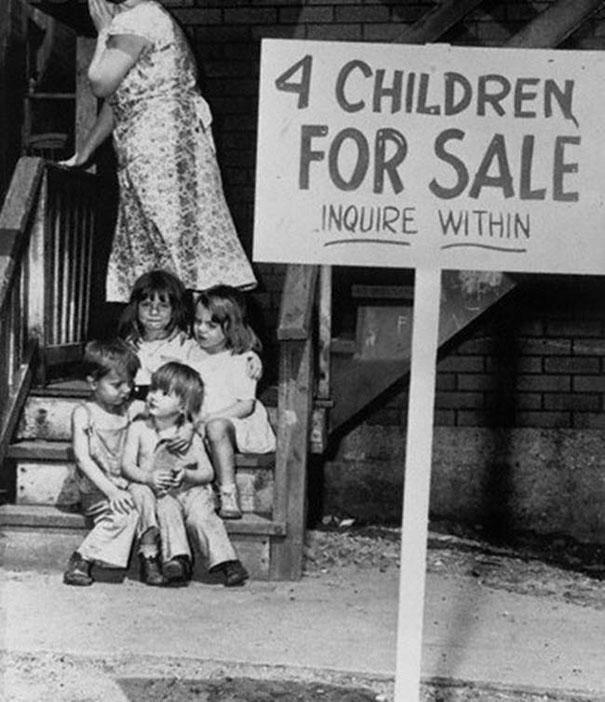 Still, when the mother was later found she did not regret her decision to dispose of her kids to the highest bidder. Really, it’s only a statue, not his real head. 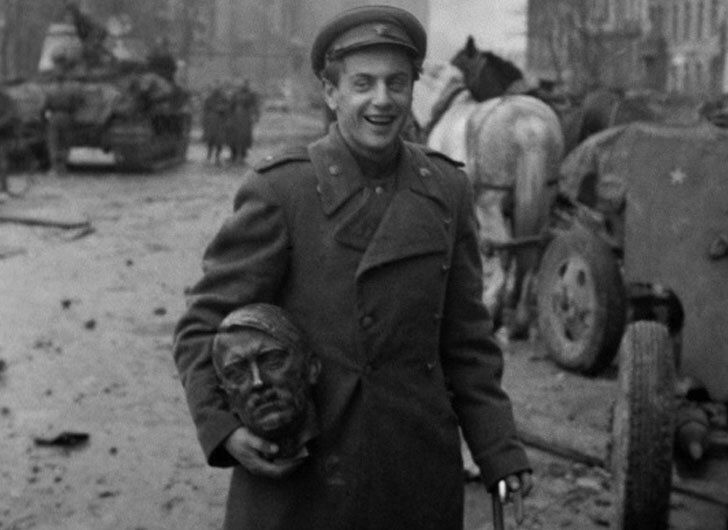 But still, the look of joy on this Soviet soldier’s face is priceless. This photo was taken in 1945 after Berlin was captured by the Allies. In an effort to rid the United States of the “evil” alcoholic beverages of the time, Prohibition came into effect. 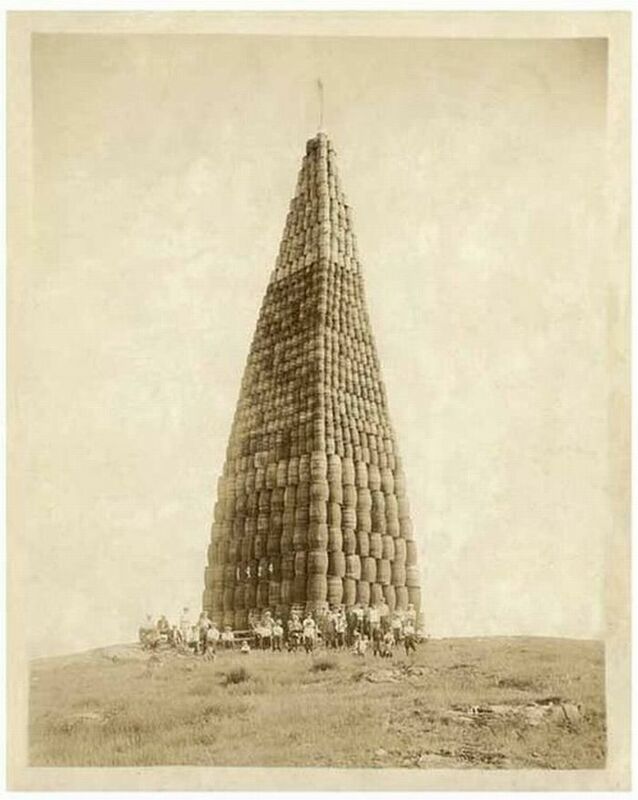 This photo was taken near the beginning of the time, in 1924, when all of these barrels of wine, beer, and other types alcohol were stacked up—and then set on fire! Such a terrible waste. Notorious for allowing nothing to bother them, British Soldiers were gathered here in 1970 for Queen Elizabeth II’s visit. 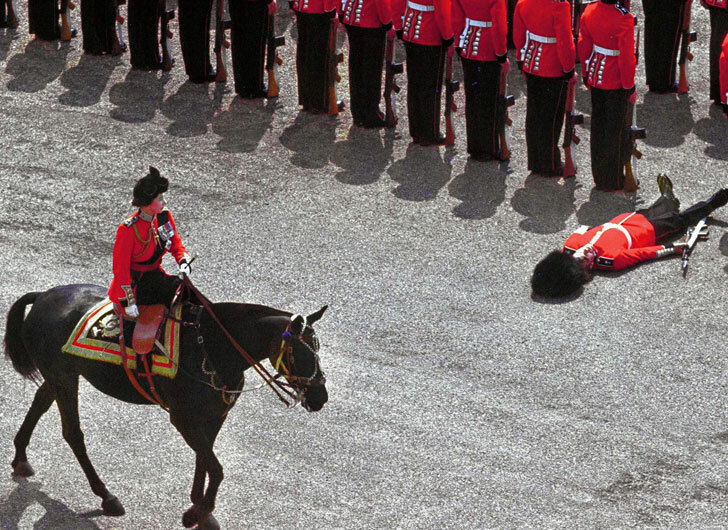 One guy passed out and, of course, no one is supposed to help them—they just keep standing at attention. 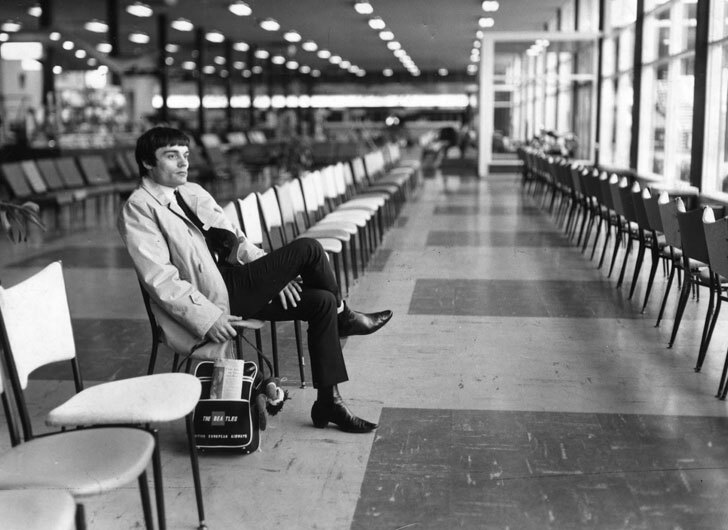 After filling in for Ringo Starr when he was down with tonsillitis, Jimmie Nicol was sitting in the Melbourne Airport, in 1964, headed back to his “normal” life following the tour. Beatle-mania didn’t seem to follow Nicol to the empty airport. Helping to change the way that the people of America viewed AIDS. 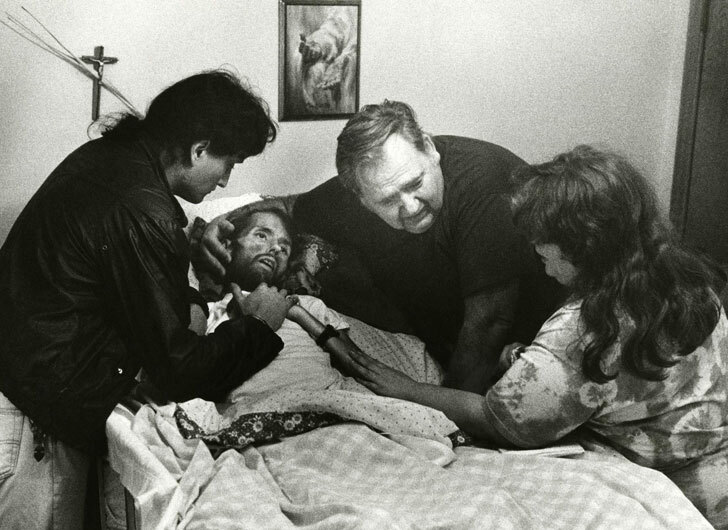 This heartfelt photo from LIFE magazine in November 1990 showed a father and other family members comforting his son, David Kirby, as he was dying of AIDS. Even though he had been estranged from his family, Kirby was welcomed back into his family home where these photos were taken. 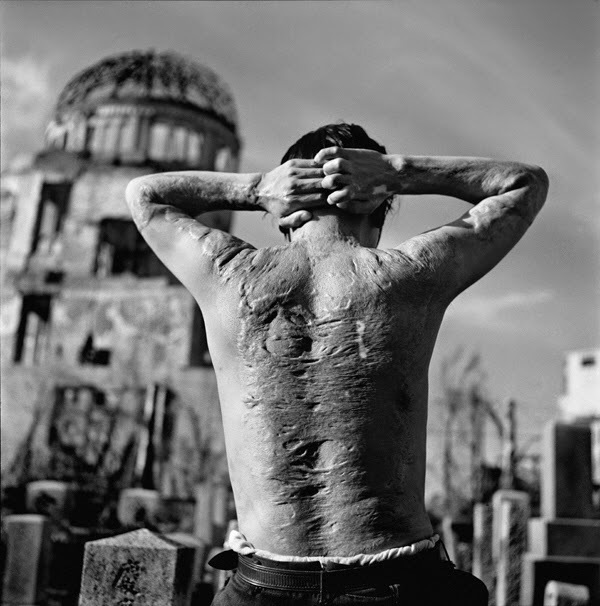 The disturbing photo of the scars on this man’s back was taken six years after the United States dropped the world’s first deployed atomic bomb on Hiroshima. Fortunately, this Japanese man escaped with his life. That wasn’t the case for over 100,000 other people who were in the city at the time. Although extremely rare, it has happened before that a person will simply burst into flames without any obvious reason. 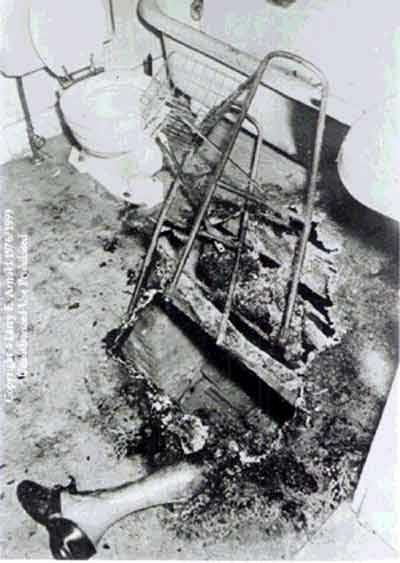 This photo from 1972 depicts a scene in a bathroom after a woman burst into flames. More recently, it happened again on a park bench in Germany in 2015. 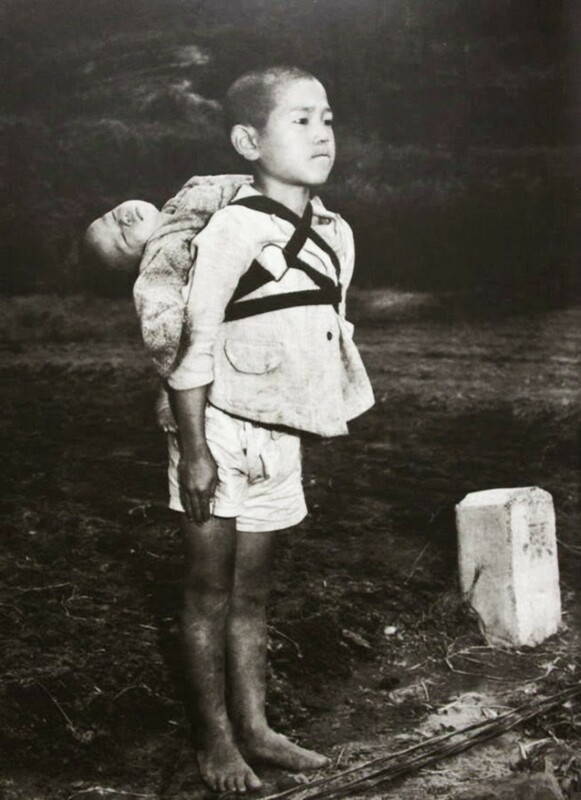 This gut-wrenching picture was taken in Nagasaki in 1945. This young boy, around ten years of age, brought his baby brother (tied to his back) to a cremation site, where he watched his brother’s body burn in the fire while biting his own lip until it bled. Sometimes you want to learn how to swim, but you don’t have a pool. But in 1922, these students didn’t let that stop them! They just used a friend to support them while they practiced their strokes. 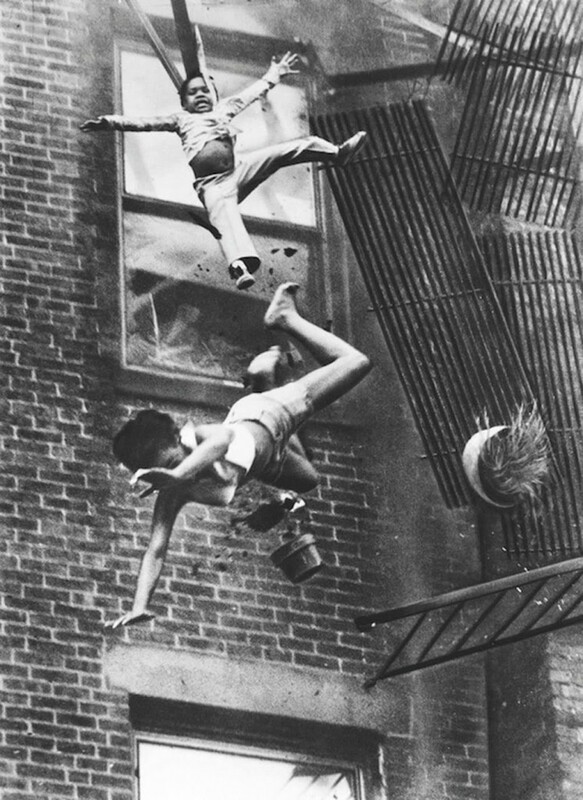 As this child and her babysitter tried to use a fire escape to get away from a fire, sadly it collapsed just moments before a fireman was about to rescue them. The babysitter landed first, and the child survived by landing on the babysitter. Airships are fabulous—when they work. 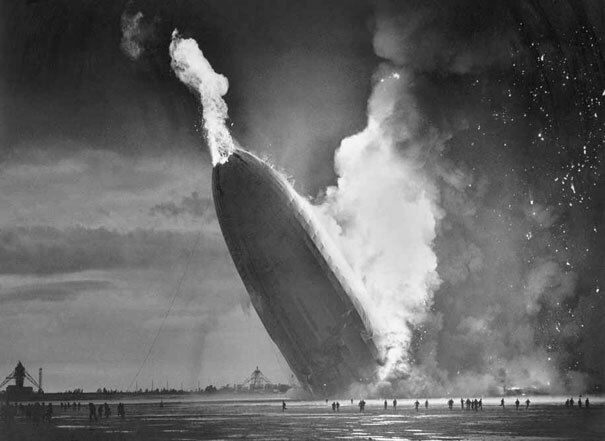 The Hindenburg was the infamous German passenger airship which caught fire and crashed in New Jersey, United States, in 1937. Fatalities totaled 36 people, including one worker on the ground. Beginning in 1951, over 1300 square miles in Nevada were put aside for nuclear testing. 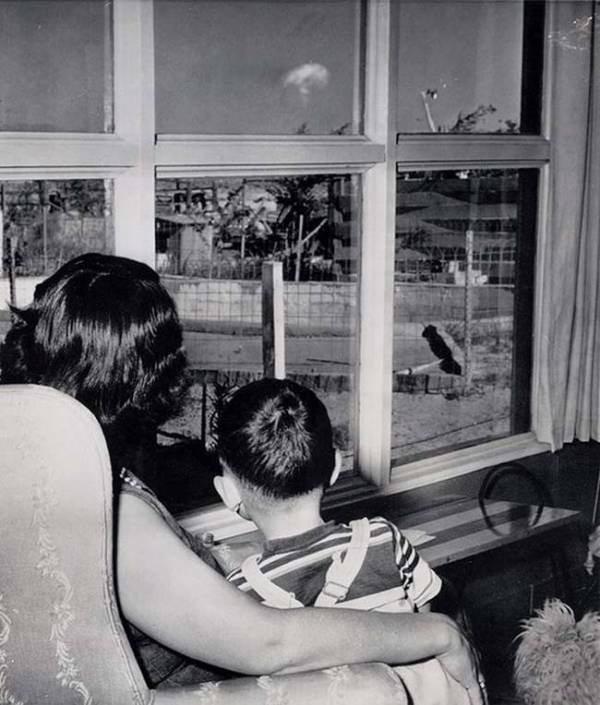 This photo depicts a woman and her child watching the mushroom clouds from their window in Las Vegas, just under 50 miles away. Who needs television? 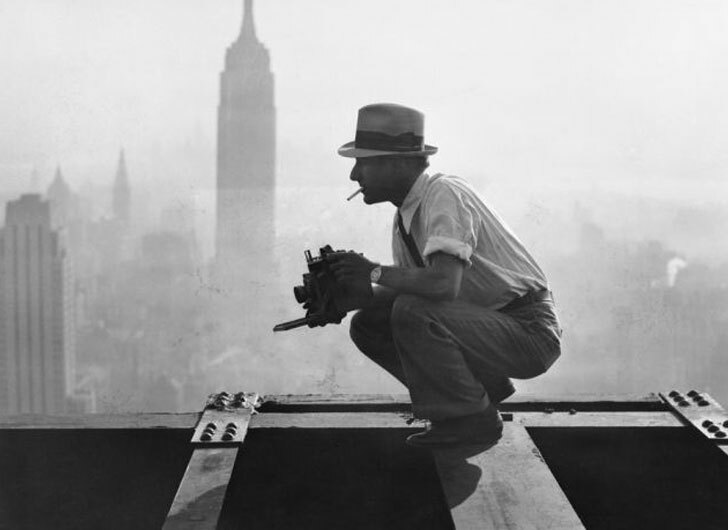 Sitting on top of a skyscraper in New York City, Charles Ebbets took his famous photo “Lunch Atop A Skyscraper” from this vantage point in 1932. He can see the city from the 69th floor of the GE building as the landscape was at the time. 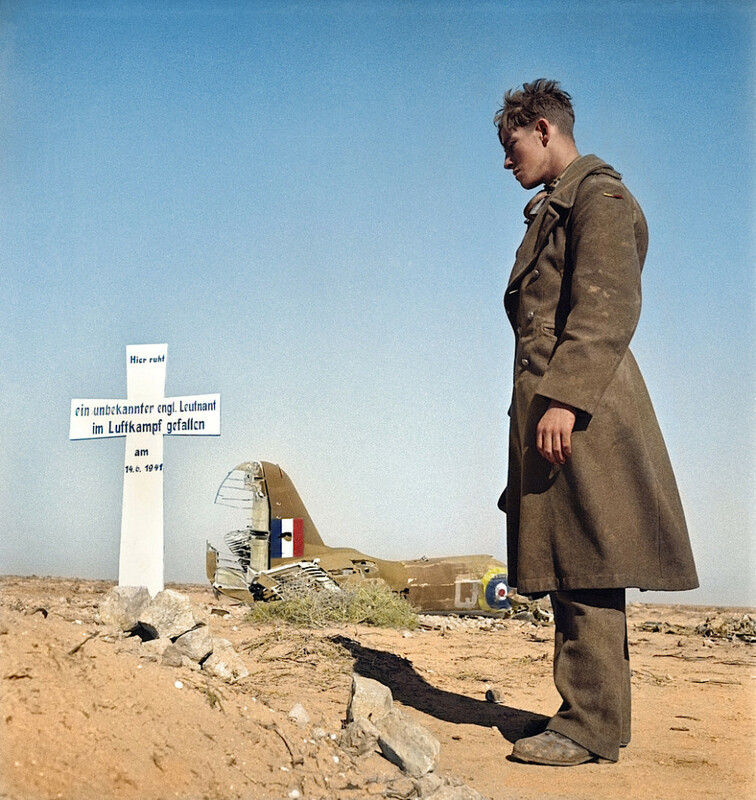 Even during wartime, there can sometimes be found respect for the dead, even those fighting for the opposite side. In this photo, a German soldier is shown during WWII, burying an unknown soldier from England who was killed in air combat. This happened in the desert in Egypt. Adding a bit more to the picture, the original plan for Mt. 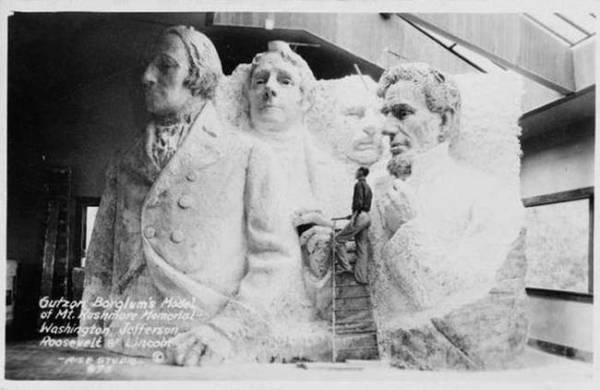 Rushmore included portions of the four presidents’ bodies, including suits and ties. But, alas, funding ran out so the heads were all that was finished. 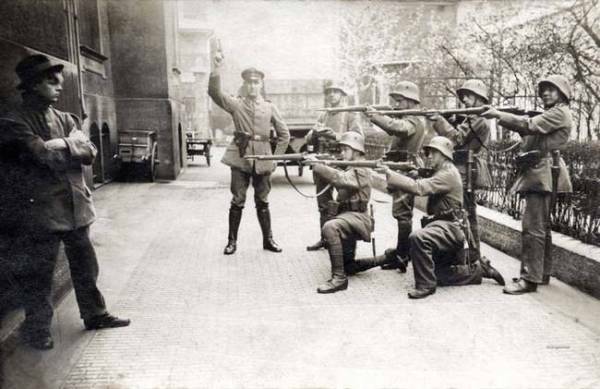 During WWI in Munich, being a communist was considered to be a crime punishable by death. 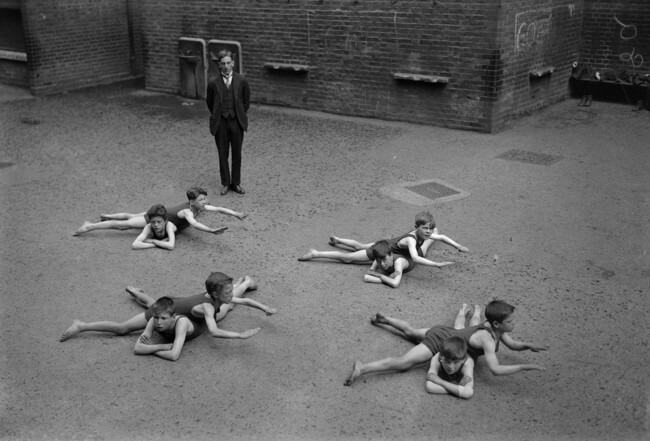 This photograph (which may have been staged for propaganda purposes) was taken in 1919. 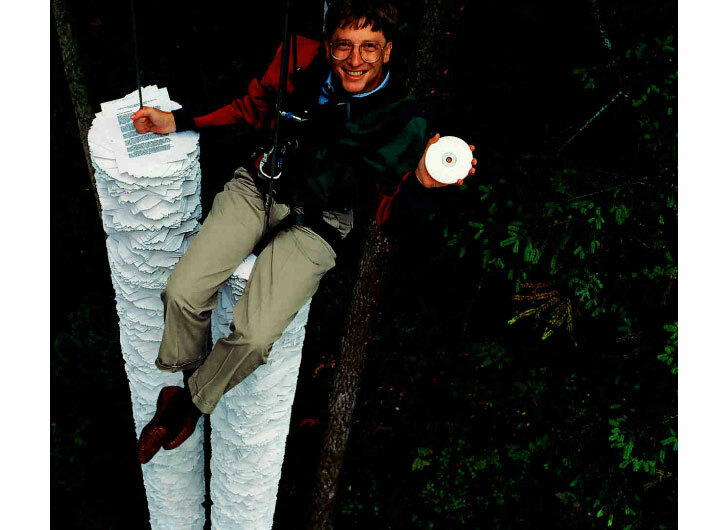 When the CD-ROM was introduced, Microsoft Guru Bill Gates wanted to show exactly how efficient this little disc was. So he had a stack of papers built to show the amount of information a CD could store. And then he sat on top of it (with a harness)! 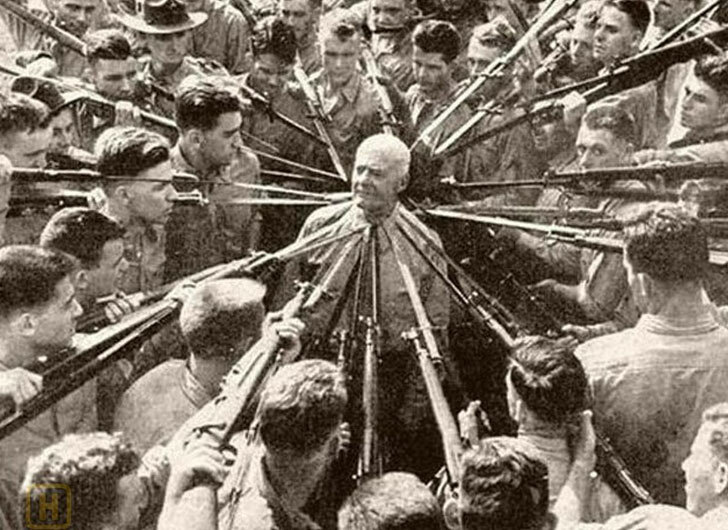 Often challenging the soldiers he trained, Anthony Biddle dared the soldiers he taught to try to surround him and kill him! Even so, Biddle was such an expert that he was able to always disarm them. That’s what made him such a great combat teacher! Well, there’s a romantic proposal! Back in 1901, times were desperate in Montana and it was critical that the fellows made it known that the women were welcome. So they posted a sign! 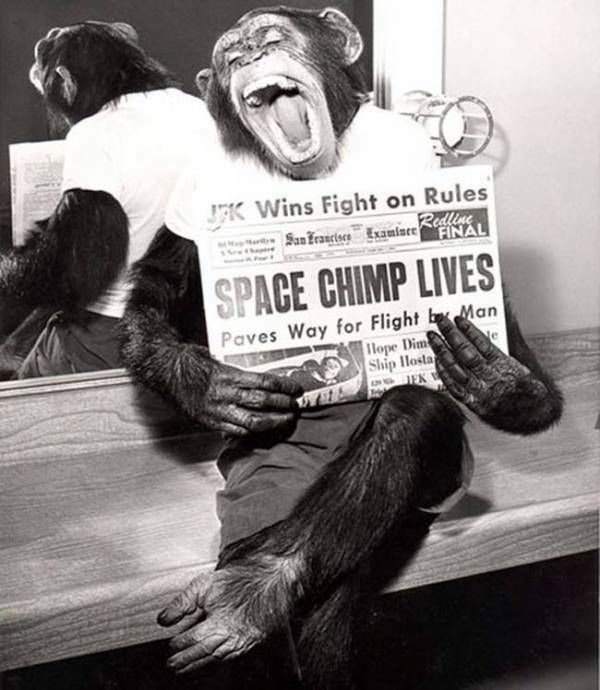 Not sure what they might find after his capsule returned to Earth’s atmosphere, the people at NASA were excited to discover that Ham, the first chimp sent into space, had survived. He was in space for just over 16 minutes and he ended up with only a bruised nose. In 1961, Ham paved the way for the eventual exploration of humans into space.